The mid-to-late (ahem) thirties among my cohort seems to follow a shockingly similar pattern. With babies done with, we begin to flail around a bit with seemingly extra bandwidth and residual inability to spend that time on ourselves guilt-free. So then you see us, pushing 40, with a third bun in the oven, a new job on the resume, or (as in my case) a life in shambles around you as you take on a remodel. Yes, I have indeed been camping out in my garage for the last three months while we build our dream kitchen. Which is hysterical because I don’t even cook, really. I had people over for dinner last Friday and I made sandwiches. I mean they were “nice” sandwiches, but you get my point. I didn’t really want a dream kitchen, or need a dream kitchen. But I guess I needed something to pour my energy into and a new kitchen, however painful, expensive and uncomfortable it was going to be, paled in comparison to the impact of having a third child, so we went for it. Which explains in part how we ended up with a fort. And a climbing wall, which if I am totally honest, has been a long-time dream of mine. It all started with that crazy nesting instinct that takes over when you have been living amongst piles of sawdust and construction equipment for months. As the end came in site for the kitchen project, and we started to inhabit the house more fully again, my husband decided he wanted to refurbish the unused storage space/shelving unit that was built into the staircase that led to our bonus room. I had no issue with (or interest in) the idea and gladly took the kids off to an afternoon birthday party while he set about on his pet project. About four hours later we returned and I came downstairs. My husband stood there, filthy, but happy. While we had been ice skating and eating pizza, he had spent the entire time cleaning out 60 years of who knows what and was ready to show off the near-completion of our new storage area. I poked my head into the unfinished storage area. It was about 6 feet by 4 feet, with a nice slanted ceiling created by the staircase. It was a cozy, secret, fun space… forget storage, this would make a perfect fort. Hey kids, I shouted. Come check this out – we could build a fort! 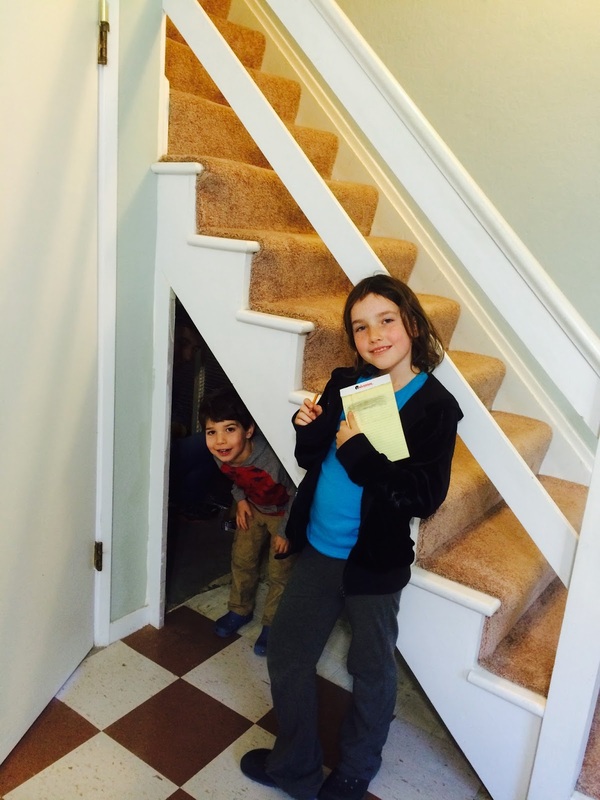 The kids came tumbling down the stairs like puppies, squealing with delight when they saw what I had seen. We all crawled into the space, imagining the possibilities. A sleepover in the fort was mentioned. Glow in the dark stars came up. I suggested a climbing wall. That would be amazing agreed my daughter. It was decided. Throughout the mayhem my husband just stood there slack-jawed - one hand still held a screwdriver, the other was resting on the shelves he had been working so diligently to refurbish. To his credit though, once the three of us poked our heads out from underneath the stairs and announced our intention to completely hijack his project in order to build a fort/climbing wall, he was completely on board and led the effort as chief architect and manual laborer. I think as a husband and father, sometimes you realize that surrender is the only option. And because he was on board, and because he is a perfectionist, we spent the better part of two weekends constructing said fort. 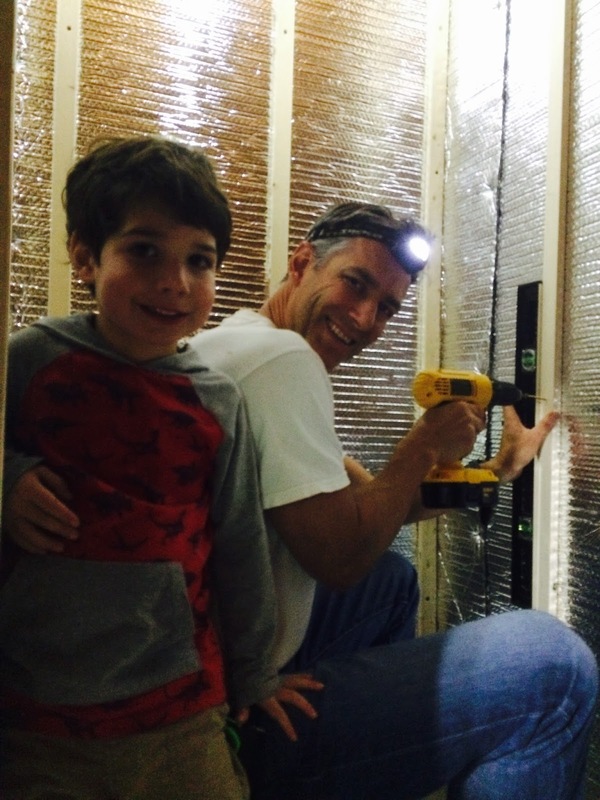 We cut and installed framing and insulation, with my daughter taking measurements and keeping notes of angles and lengths and cuts. Both kids took turns marking the cuts and using the saw. 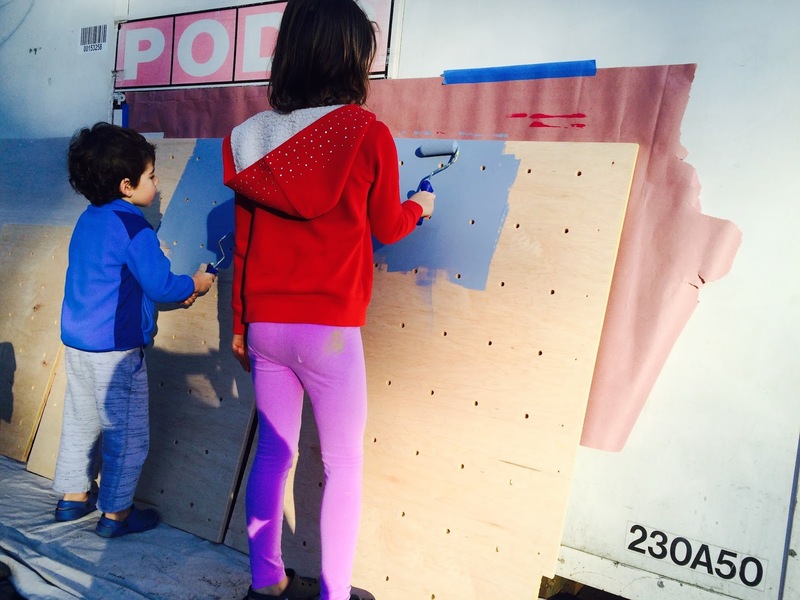 We put up drywall and then the kids chose the color scheme (fuchsia, blue and lime green) and painted the walls themselves (and had paint in their hair for days afterwards – an undeniable fingerprint of neglect). We laid padding and carpet and put up trim. 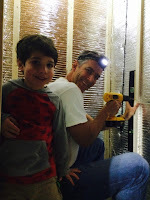 We installed inch-thick plywood, marked and drilled 120 holes, and placed 120 bolts for the climbing wall portion. 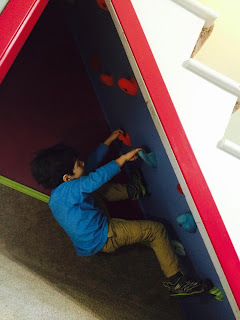 We installed tens of climbing holds of various colors, shapes and sizes. We made many trips to the hardware store. We worked late into the night. We finished it before they finished the kitchen. Over the years we have worked to make our house a fun place to be for the kids – turning the garage into a playroom, complete with a trampoline, swing, trapeze and punching bag. We hung a swing from a backyard tree and build a kid-friendly garden that suffers as much from being trampled as it does from gopher invasions. I am so excited to add a climbing fort to the list of places that the kids can claim as their own and play in to their hearts content. Selfishly, I am also glad that the need to build labor-intensive forts out of sheets chairs and pillows (that I end up having to clean up) is also necessarily diminished. Pleased with our efforts, we mentioned the fort project to our contractor the other day. He smiled knowingly at us. Every house needs a fort he said. I completely agree. This picture probably make so much more sense now, right?